“Part of the thing about secrets is that they have a certain kind of mystery to me. A dark secret, I don’t want to see something so clearly that it would destroy an imaginary picture…secrets and mysteries…provide a beautiful little corridor where you can float out and many, many wonderful things can happen,” vividly describes David Lynch, essentially explaining the ambiguous abstractions and fruitful lack of coherency in his films and Twin Peaks. Certainly Lynch’s endorsement of a mystery with no end and secrets with no resolve is no surprise considering he’s voiced this sentiment repeatedly throughout his career. However, the drive for concrete answers and easy legibility that Lynch continually rages against still maintains a stronghold in creative thought. On some level, it’s probably natural that we all want to figure it out (whatever it happens to be). And yet, this places limits on active viewership, as seen in art exhibitions that are accompanied by extensive press releases, which articulate, in detail, the “correct” insight into the “right” observations to have about an artwork. Mostly, I assume, the motivation to lay out an exhibition in ArtSpeak 101 is so the arts writers that just plagiarize from the press materials (I see you) have something to say. And yet, it’s this concrete theorization about artwork, as well as its definitive connection to the artist’s identity or personal experiences, that can render art-viewing boring as hell. Like Lynch says in an early interview on Eraserhead, “When you go into a mystery film and they tie it all up at the end–to me, that’s a real letdown. In a mystery, somehow in the middle, it’s all opened up and you can go out to infinity trying to form your own conclusions. There’s so many possibilities. And that feeling is, like, real neat to me” (8). Me too, David, me too. 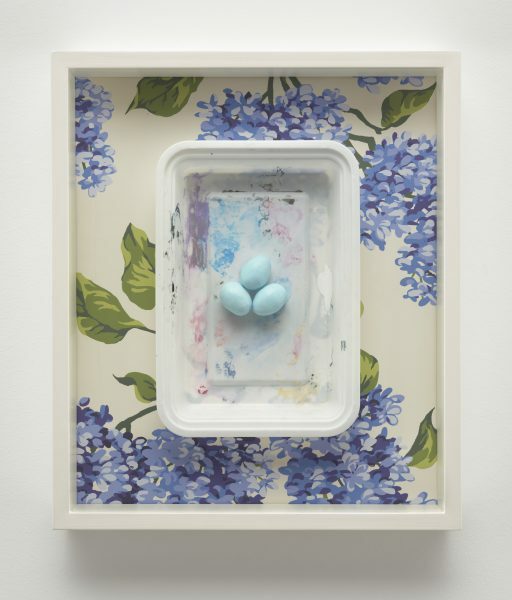 Thankfully, Robert Gober’s current exhibition Tick Tock at Matthew Marks Gallery, his first show since his major retrospective The Heart Is Not A Metaphor at the Museum of Modern Art, embraces this sense of infinite possibilities and a lack of definitiveness to its unending benefit. Tick Tock presents the viewer with just enough space to intellectually wander, while also harkening back and reworking symbols from Gober’s older work to make the experience feel haunted. And yet, even if a viewer has seen the imagery before like the interwoven limb and industrial pipe pattern on the cover of Lynne Tillman’s American Genius, which also features in several of the works in the show, Gober doesn’t seem to provide any direct answers, preferring to languish in surrealist potentiality by turning over the power of interpretation to the individual viewer. Overall, Tick Tock, as its title infers with its reference to a constant nagging reminder of mortality, poetically mines the ephemerality of life–its fragility and the continual proximity to death. This thematic is introduced to Tick Tock immediately with an early childhood drawing by the artist hung in the entrance. 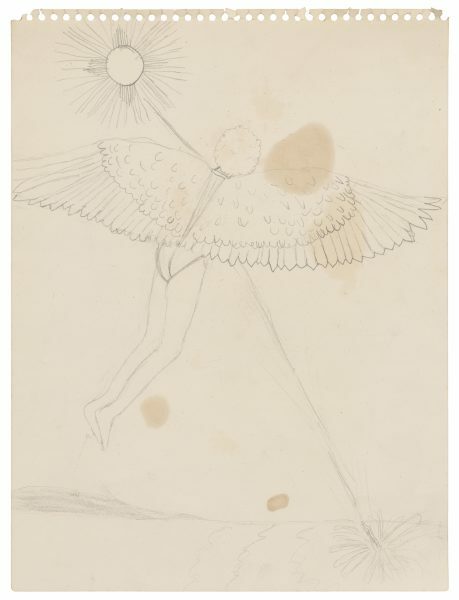 Created on spiral-bound paper from a notebook, this drawing, made when Gober was just 13, portrays a winged figure hurtling toward a bright sun, bringing to mind Icarus (for whom the work is titled) on his doomed harebrained flight. It’s a poetic metaphor, especially for a teenager, but it hints at a, as Lynch would say, “dark secret” that pervades the exhibition. Time, especially, appears to collapse throughout Tick Tock, particularly through Gober’s employment of reoccurring symbols from his previous works. Take, for example, his room of Untitled pencil and pastel drawings in the second room of Matthew Marks. These drawings all feature bare chests and backs, lightly sketched in pencil. The torsos are emblazoned with a forest of tree trunks and stumps and, over the heart, a barred window that opens to a vibrant blue clouded sky. 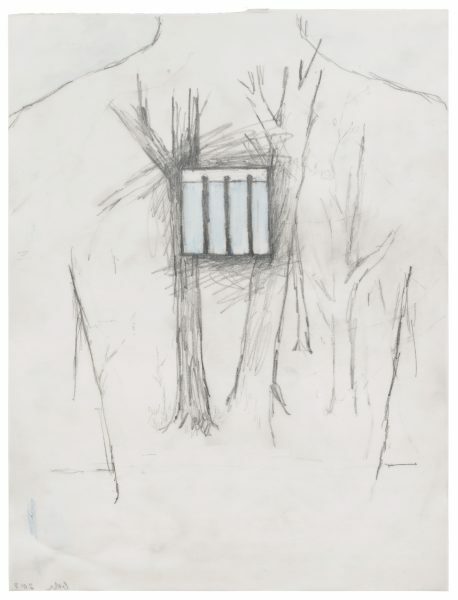 This, as Nick Cave describes in his song “Knockin’ On Joe,” “square foot of sky,” seen through the bars of a prison, has been mined by Gober previously, most notably in his installation Prison Window. 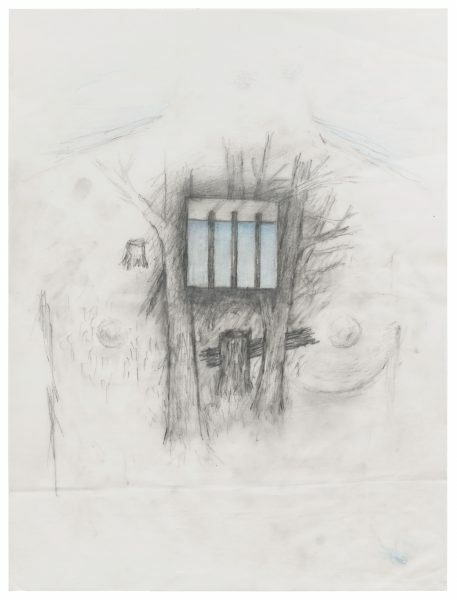 Additionally, the bare-chested drawings also echo a prior art piece–Gober’s Slides of a Changing Painting from 1982-1983. This slideshow also portrayed chests with objects over the heart, including doors, pipes and wooden treasure chests, with purple lesions on the body that recalled Kaposi’s sarcoma. While the flesh of these earlier works used color, Gober standardizes the image in his new body of work, stripping the torsos of all color, with exception of the blue sky, rendering them ghostly and ethereal. The figural forms are also of ambiguous gender–some are flecked with chest hair, others have breasts and some have a combination of half-masculine, half-feminine features. With over a dozen of these headless identity-less bodies surrounding the room, it is a chilling viewing experience to say the least. Ultimately, though, the prison window embedded in the chest cavity encourages the most curiosity and a seemingly endless range of cultural and metaphysical references. The prison window could represent, at once, our imprisonment inside our own bodies–a life sentence we all have to serve–as well as the potential for transcendence and a desirable possibility for escape. It could also reference a complete nihilistic vacuity like the decadent blue sky that Michel gazes off into a the end of Andre Gide’s The Immoralist or the copious depictions of fluffy clouded skies in René Magritte’s surrealist paintings. Perhaps it even is a symbol for the opening the door of consciousness if you want to get all woo-woo transcendental meditation. 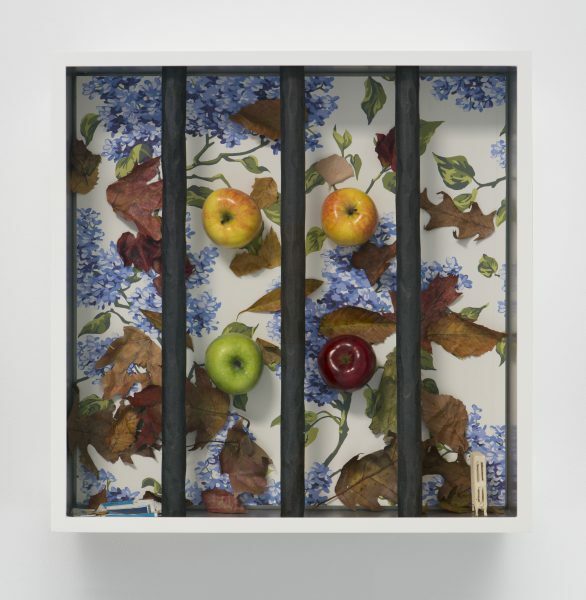 The prison window may, in fact, be all or none of these things, which is what makes the opacity of Gober’s work so exciting. Like this scattershot, star-gazing version of memory, Gober’s Tick Tock, despite being named for that aural indication of the passing of time, embraces a queer sort of temporality as theorized by Jack Halberstam in In A Queer Time and Place. Pinpointing the AIDS pandemic–something Gober addresses in his own work–as a turning point for new relations to time, Halberstam quotes poet Mark Doty who wrote, in reference to the pandemic, “All my life I’ve lived with a future which constantly diminishes but never vanishes” (2). Halberstam goes on to articulate, “Queer time, as it flashes into view in the heart of a crisis, exploits the potential of what Charles-Pierre Baudelaire called in relation to modernism ‘the transient, the fleeting, the contingent” (2). 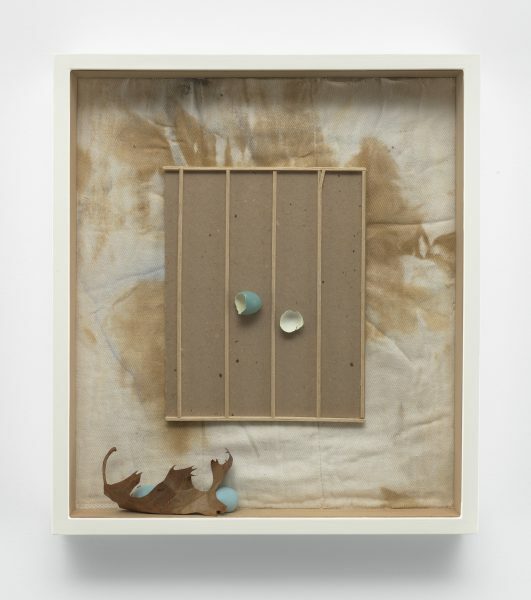 Like Doty’s lyrical phrase and Halberstam’s invocation of the transient and the fleeting, Gober’s work, in particular his wall-mounted sculptures that resemble shadowboxes, further poetically engage with the frailty of life through abstruse yet evocative metaphors. 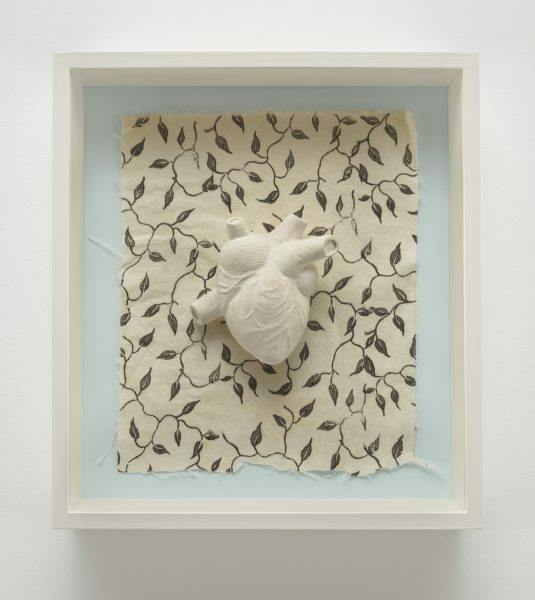 With cloth diapers and other fabrics covered in splotches of colored paint, as well as printed fabrics of cherries and lavender, acting as a backdrop, these sculptures include three-dimensional elements such as blue robin eggs, white plaster hearts, apples, an ear and even, the rust-colored rubber head of a plunger. 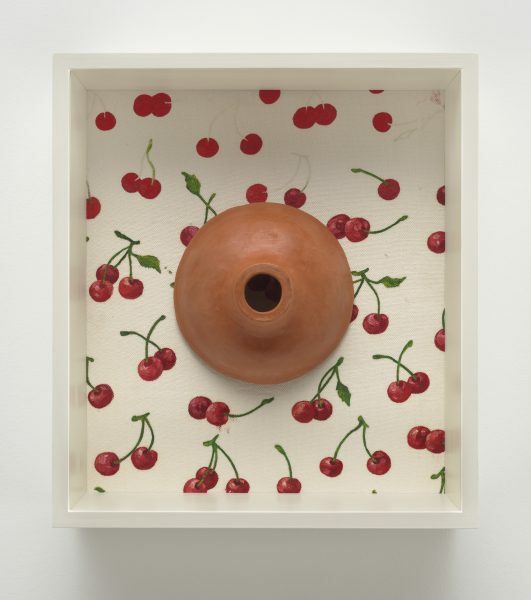 While there are no obvious Gober metaphors like drains or sinks, these works, too, contain reoccurring symbols such as Stained Diaper on Wallpaper, which features wallpaper printed with the image of a highway that can be seen in Gober’s installations. Like the room full of Untitled drawings, these sculptures point to a seemingly endless interwoven mystery of references. In particular, the robin’s eggs, which are broken in Cardboard, use the natural environment to gesture to a universal precariousness of life. This is further articulated with the presence of a browned fall leaf at the bottom of the work that recalls Eric Rhein’s ongoing project Leaves that uses the natural symbol of the leaf to memorialize people who died from complications from AIDS. But not all is life or death here, the works also have an apparent connection to creativity with the fabric and plastic containers soaked in paint. This range of references is only compounded in the last room of the gallery, which features larger versions of these wall-mounted sculptures including Untitled with four apples, a crumbled cigarette packet and a tiny doll-sized mini-radiator. This mix of objects brings a whole slew of recollections–Snow White, childlike innocence, death and of course, David Lynch’s Lady in the Radiator from Eraserhead who sings “In heaven, everything is fine.” What does it all mean? Who knows. Gober seems to be presenting an offering or an opening up of possibilities, which is further symbolized in his nearby installation Untitled. 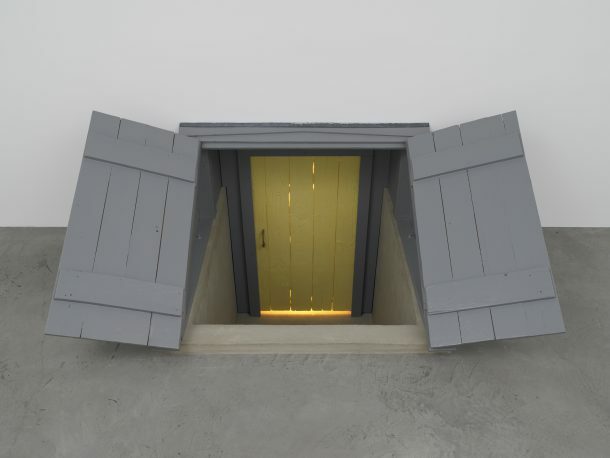 A recreation of the cellar door to his childhood home that was built by his father, Untitled literally presents an opening. With a dull grey exterior surrounding a set of stairs, Untitled beckons viewers to a doorway that is illuminated by a rich golden yellow glow that indicates something going on beyond its doors. Maybe it’s the leftovers from the Yellow Brick Road from The Wizard of Oz after Dorothy got flung up into its orbit. What it is, definitively, is a preservation of mystery by abandoning definitive conclusions. As David Lynch tells Chris Douridas in 1997, “I love a mystery that at the end of the mystery allows you room to dream. Continue the dream.” And luckily, Robert Gober leaves the viewer with a lot of room to dream. Tags: David Lynch, In A Queer Time and Place, Jack Halberstam, Mark Doty, Matthew Marks, Matthew Marks Gallery, mystery, Robert Gober, temporality, The Heart Is Not A Metaphor, Tick Tock. Bookmark the permalink.